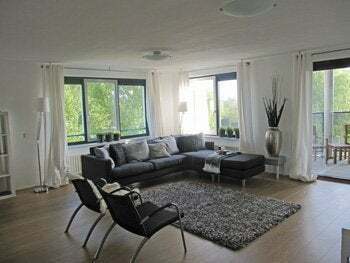 Luxurious furnished 3-room apartment in quiet area, located near local shopping center Westwijk, bus stop, Japanese kindergarten, near Schiphol, international school. Quiet & green area, with free parking in the street. Layout 3rd floor (with lift): entrance, hallway, video-intercom door opening system; toilet with sink; spacious bathroom with bathtub, shower, sink, toilet & radiator; spacious master bedroom with double bed; 2nd bedroom with sofabed, desk & wardrobe; spacious & stylishly furnished living room with access to balcony; luxurious open fully equipped kitchen (oven/microwave, dishwasher, gas cooker with 4 burners, fridge/freezer) with diningtable; large utility room with washer & dryer. The apartment is completely renovated and has laminated floors throughout.